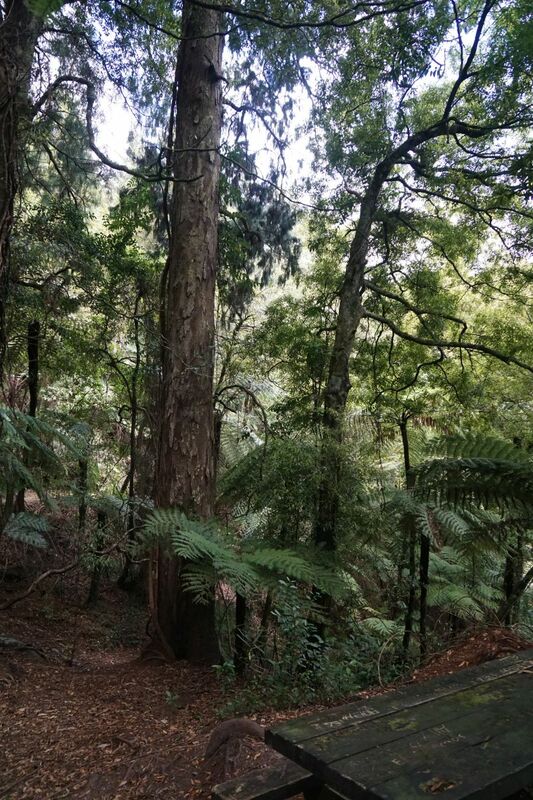 Some information about the track is available on the Tauranga City Council web site, where it is called the Rimu Totara Track. 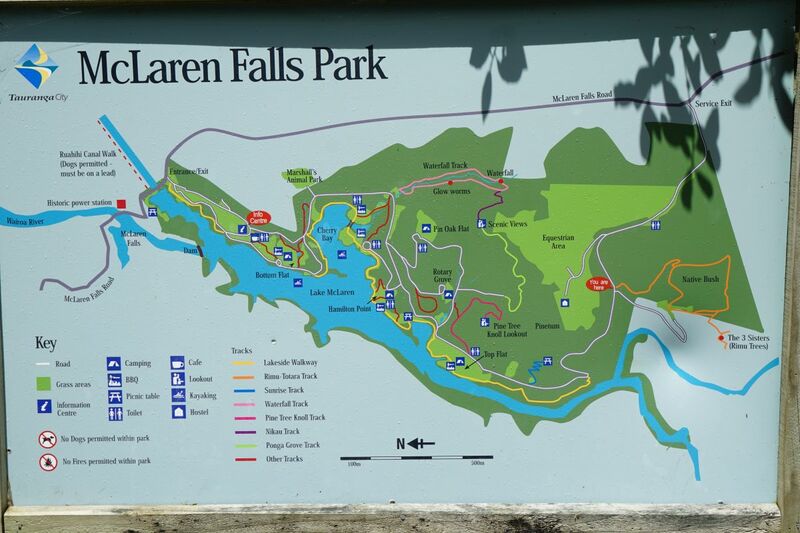 A map of McLaren Falls Park is also available on the web site, and on display panels within the park. Unfortunately the tracks are not well marked. 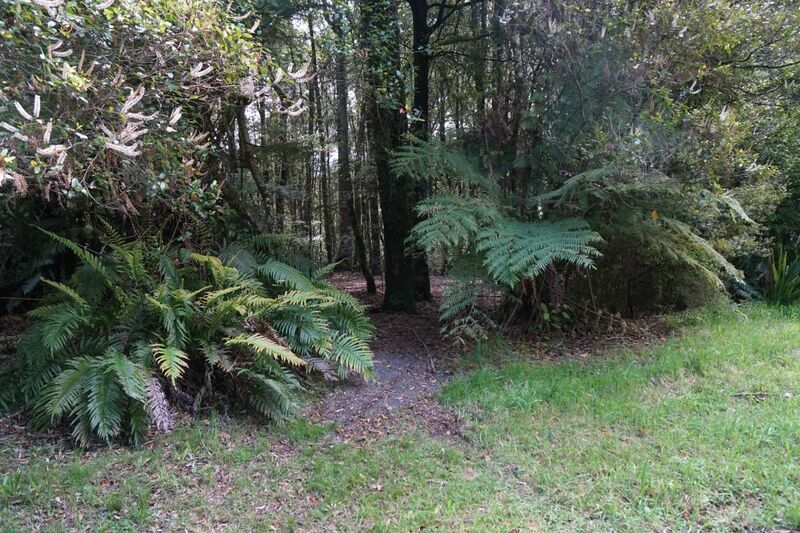 Most are obvious and easy to find, but it took some effort to locate the side track from the loop to the 3 rimu trees. Toilets can be found at various locations within the park, and there is an information centre near the park entrance. 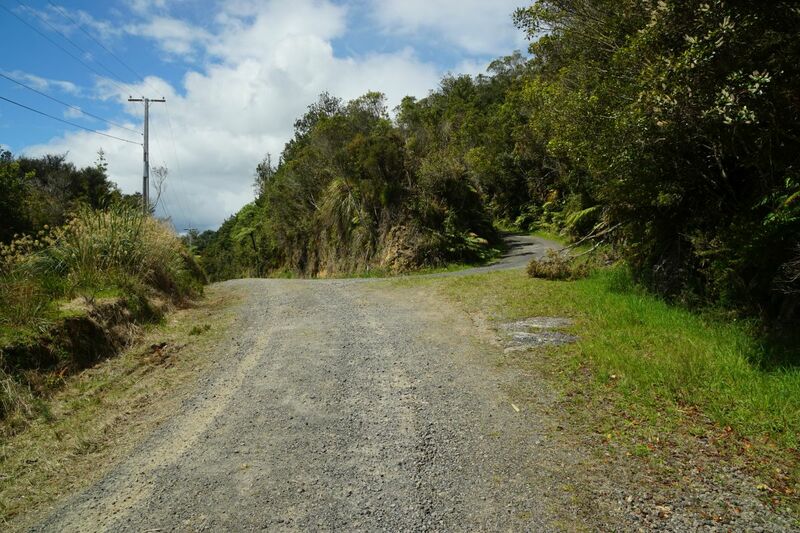 A few parking spaces are available at the road junction by the start of the Rimu Track. 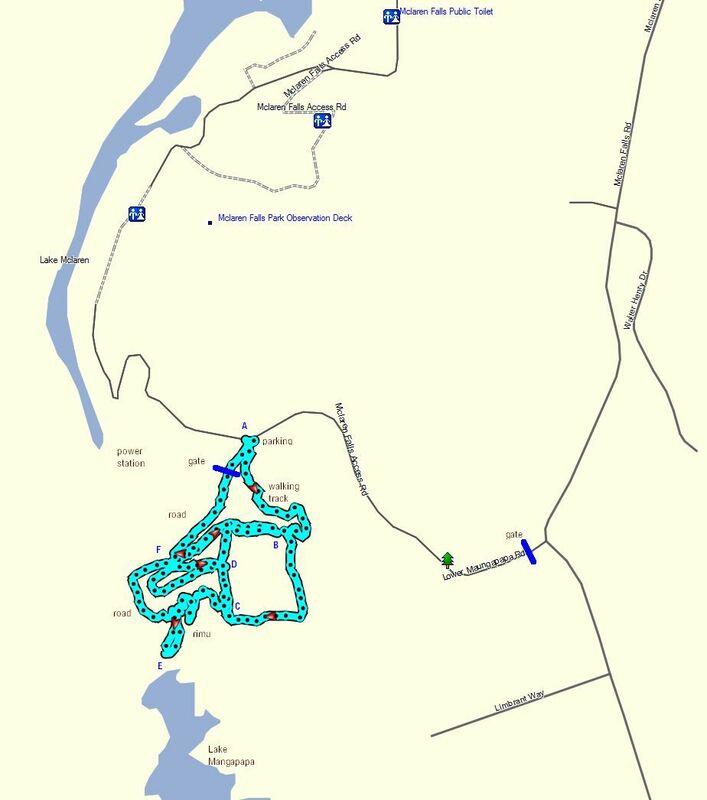 On the web site the Rimu Totara Track is shown as being 979 metres long, and requiring 23 minutes to walk, although it’s not obvious which route this covers. Walking all the tracks and roads in the Rimu Track area, some of them twice, took almost an hour and covered a distance of 2.9 km. The Tauranga City Council map of McLaren Falls Park shows the Rimu Track and Lake Mangapapa on the far right. However the start of the track is actually by the road junction, and not some distance up the road by the locked gate as shown on this map. Note that north is to the left on this map. 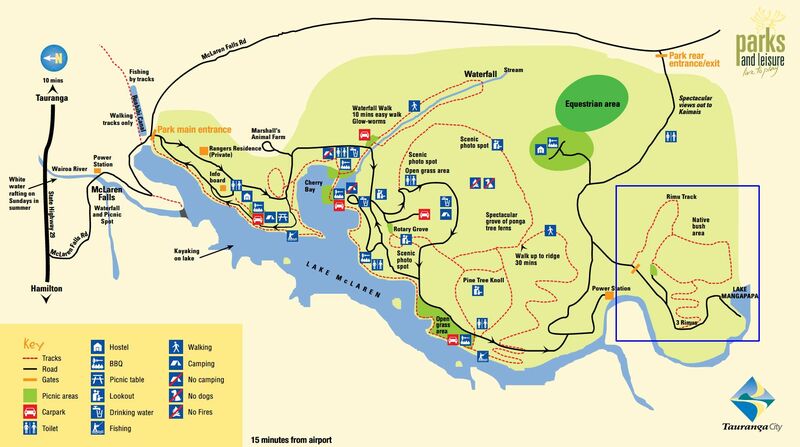 The information panel and map at the start of the Rimu Track does not show the lake, or the road which can be followed from the lake and back to the parking area. 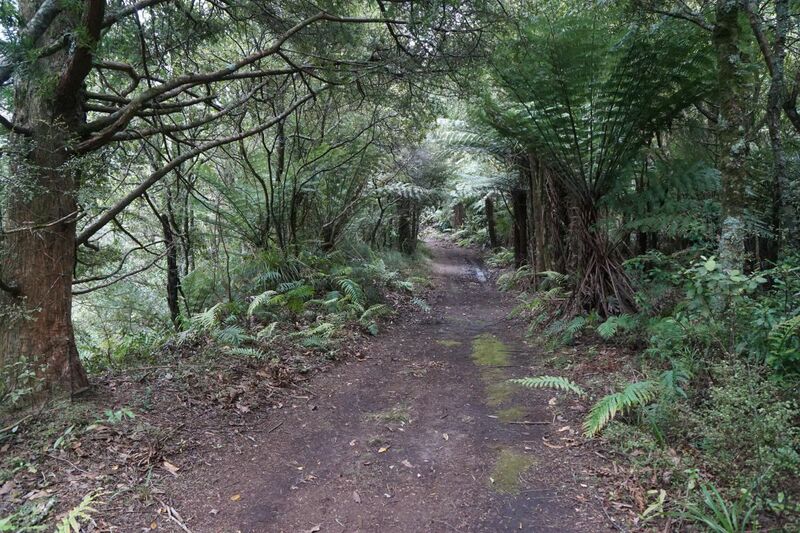 Here the track is called the Rimu-Totara Track, and the start of the track is shown in almost the correct location. Note that north is to the left on this map. The junction with the small parking area. 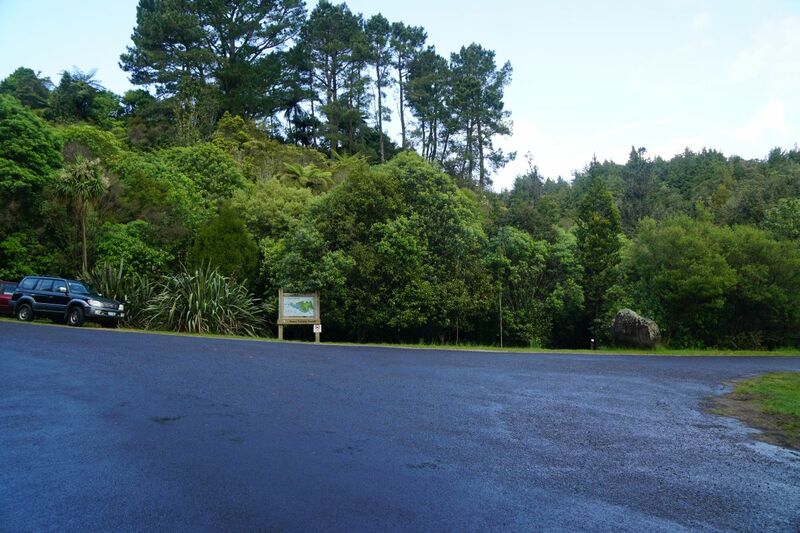 The road to the right leads to Lake Mangapapa, the one to the left leads to the park rear entrance/exit which is normally closed, and the one on picture bottom leads back to the main entrance. The start of the Rimu Track is by the large rock to the right of centre. 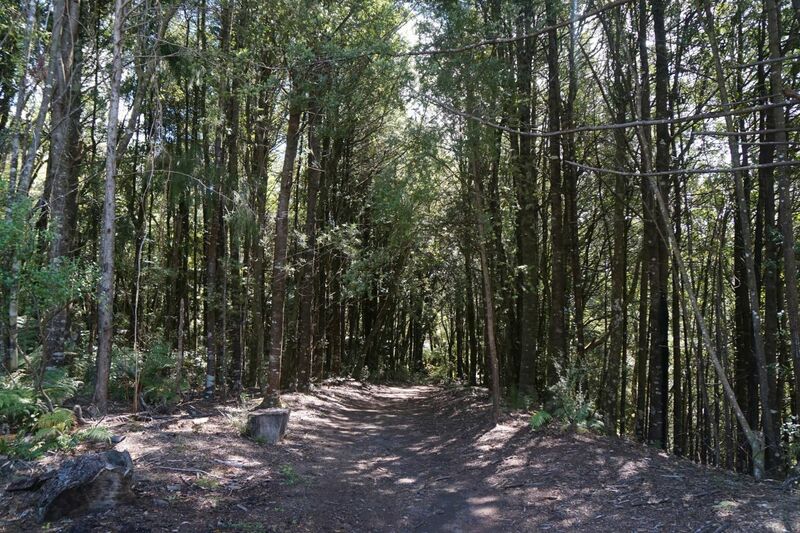 There are several small kauri trees by the track start. The first part of the track is well formed, with a few steps. On the steeper uphill part of the track it is somewhat rougher, but still easy to find and to walk. 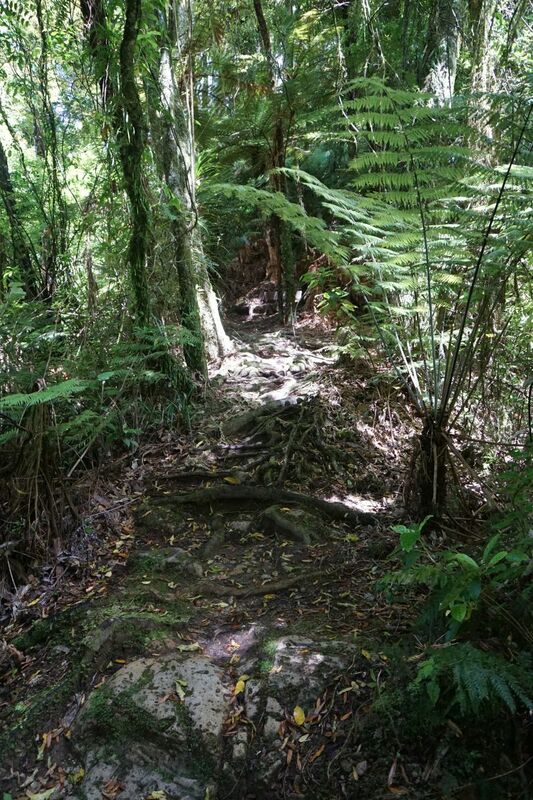 A longer set of steps leads up a steeper section to a small clearing, and one corner of the loop track on a plateau. 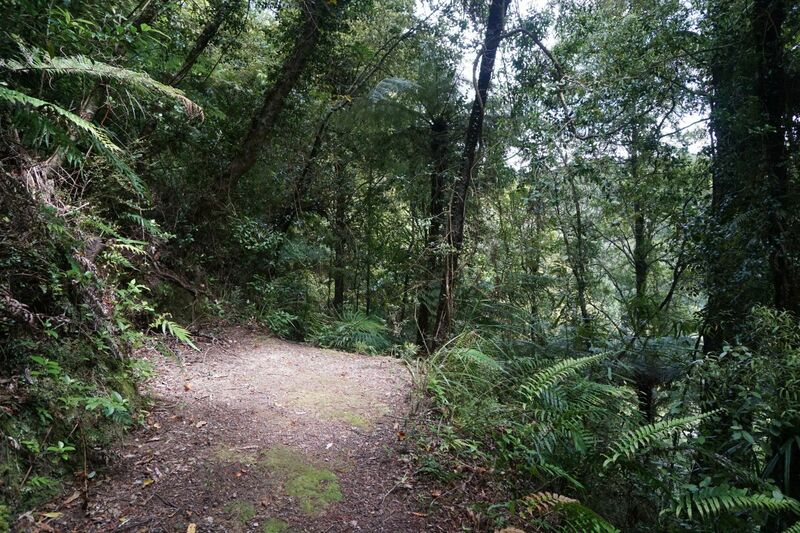 The track through bush to the left from the small clearing is the easiest and shortest route to the side track to the rimu trees. The one to the right can also be followed, but part of that is open grass area. 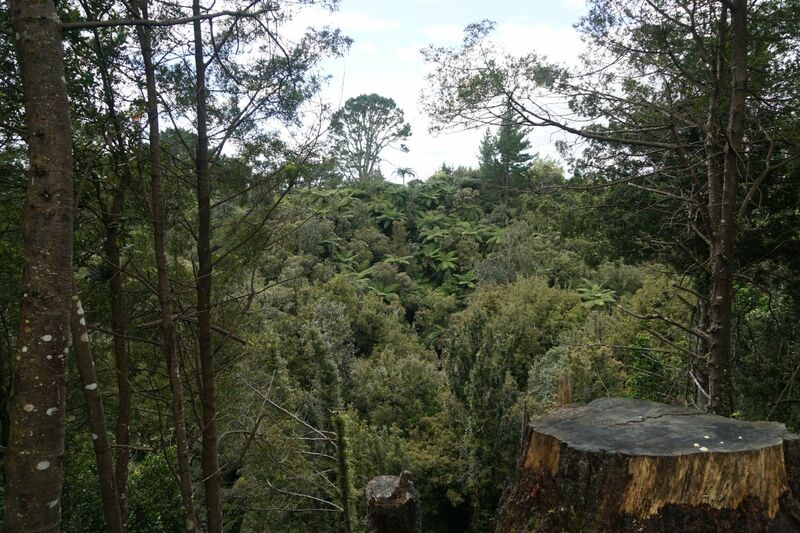 Looking from the small clearing, across the valley which the Rimu Track follows. Taking the left branch from the small clearing, walking the loop track in a clockwise direction. The track opens out onto a grass area. 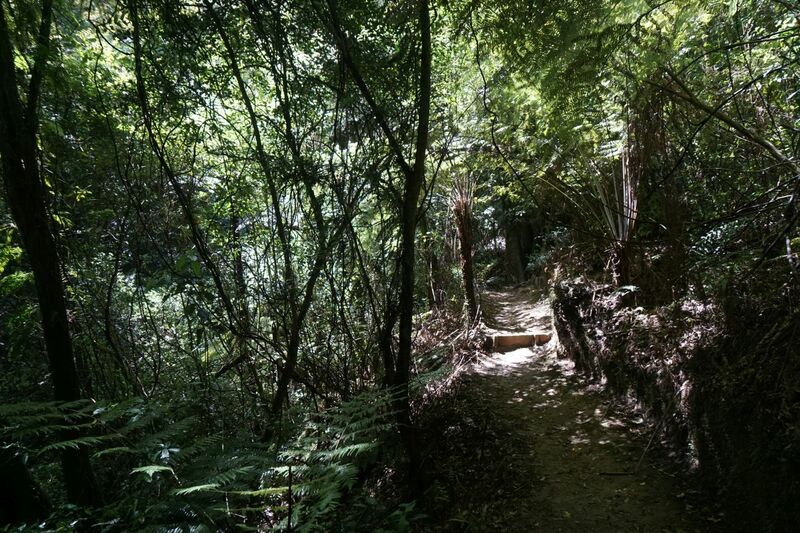 The track to the rimu trees is near where the track opens up. 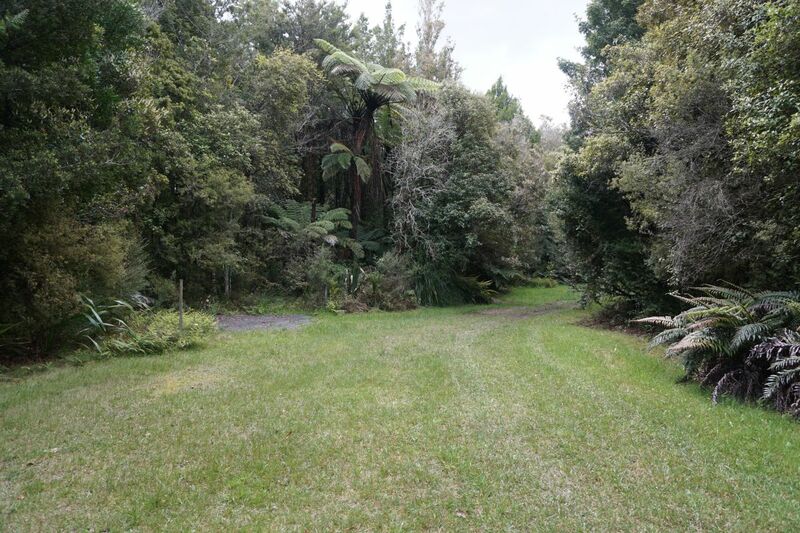 The start of the track down the hill to the 3 rimu trees is not obvious. It is at picture centre, between the ferns and past the large tree. There are no markers to show that this is the entry point to the track, and it is much closer to the last right-angle turn on the loop track than shown on the maps. 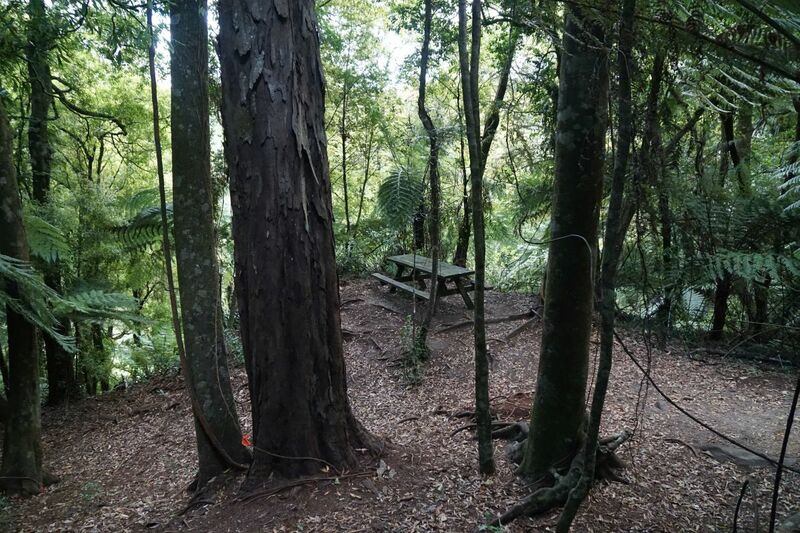 The track leads downhill through trees to a picnic table and the 3 large rimu trees. The first of these is in the foreground, to the left of the table. 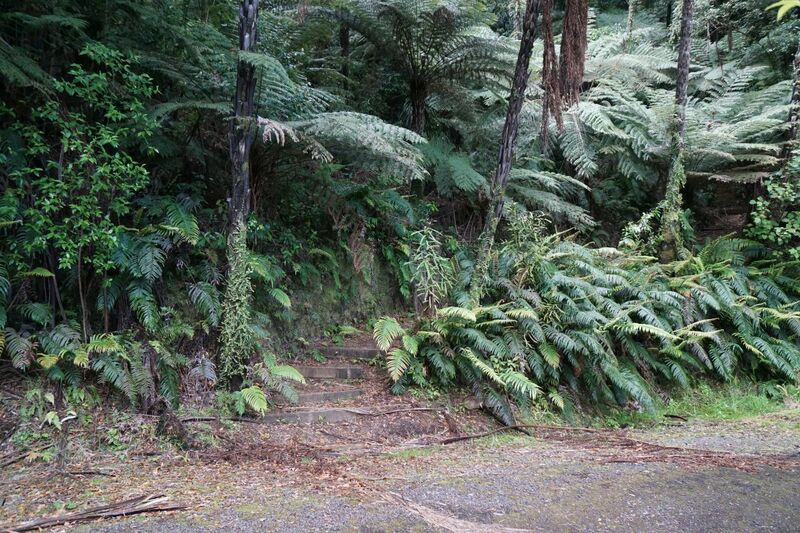 A short track to the left leads to a small viewing point for another of the 3 rimu, seen on the far right. The third tree is almost next to the picnic table. The track to the right from the picnic table leads down to the road to Lake Mangapapa, and the road back to the junction and parking area. 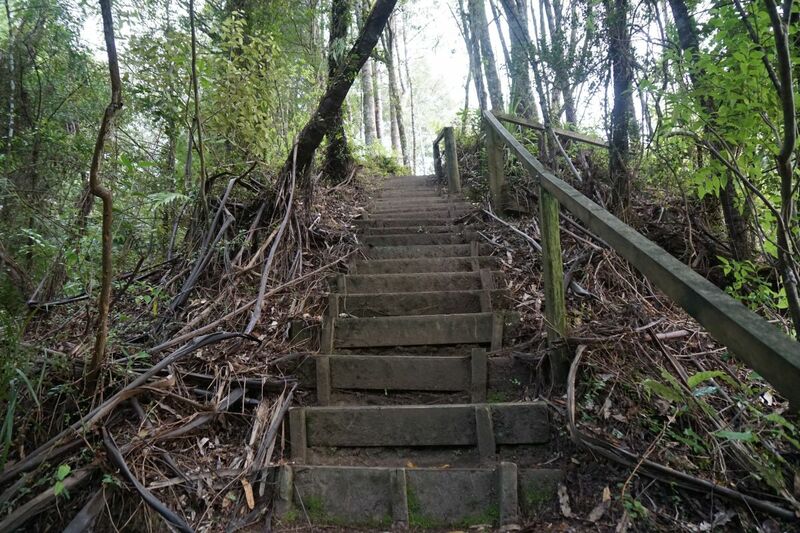 The steps are the start of the track up the hill to the 3 rimu trees and to the loop track. 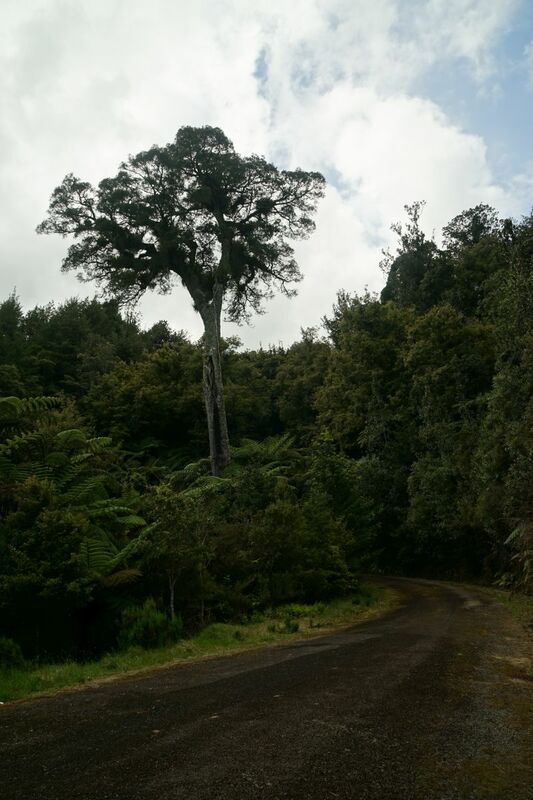 Another large tree is almost straight across the road from the track to the rimu trees. 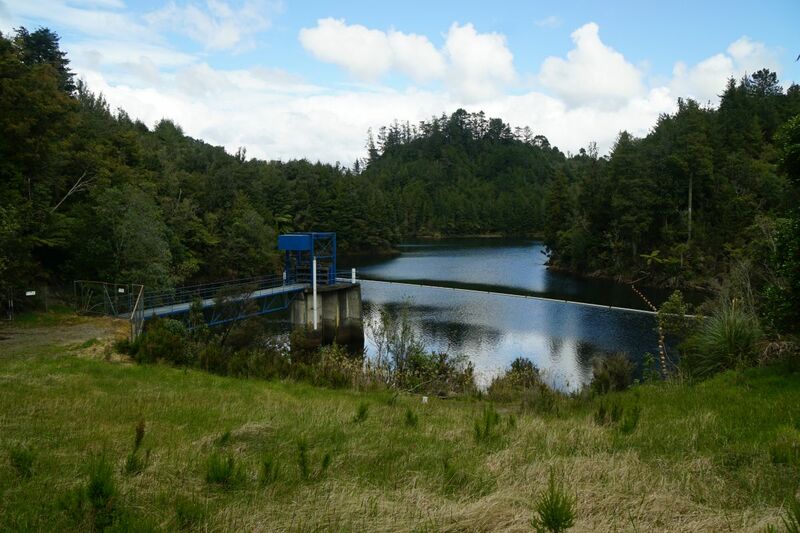 Lake Mangapapa is only a short walk down the road from the rimu track exit. The dam is hidden behind the vegetation on the right. 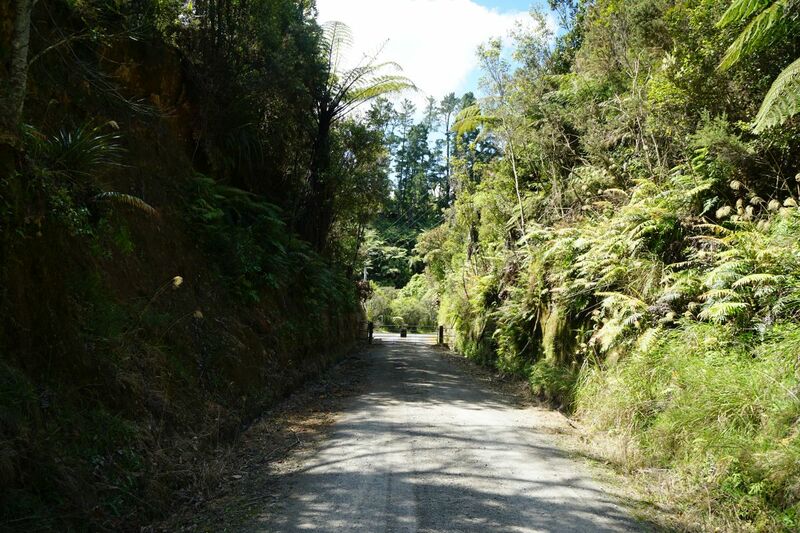 The gravel road leads back to the road junction and the start of the Rimu Track. The road to the right leads up to a grassed area and one corner of the loop track. There are active beehives on one side of the grassed area, on the far left. 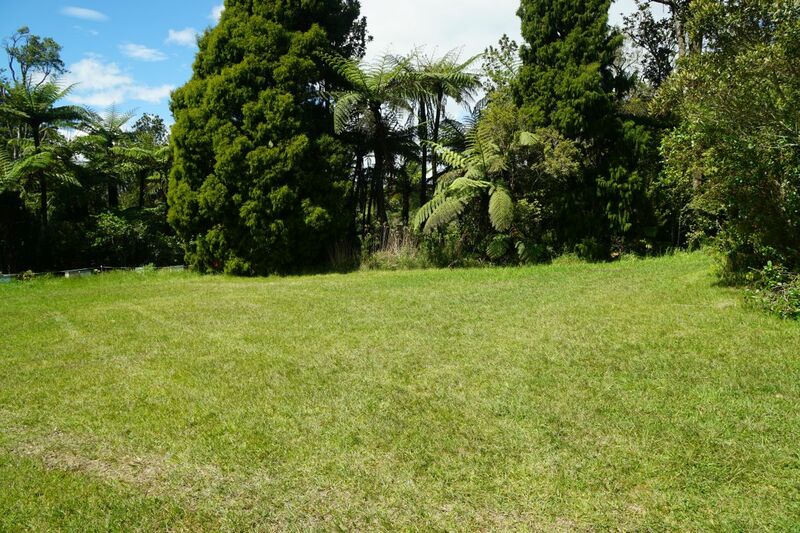 The grass track at the upper right leads directly to the small clearing and the one to the bottom right leads to the start of the track down to the 3 rimu trees. Both of these grass tracks are part of the loop track. The well-formed track, part of the loop track, leading back to the small clearing. Following the road back to the starting point there is a locked gate, with an opening to the left of the gate for walkers. 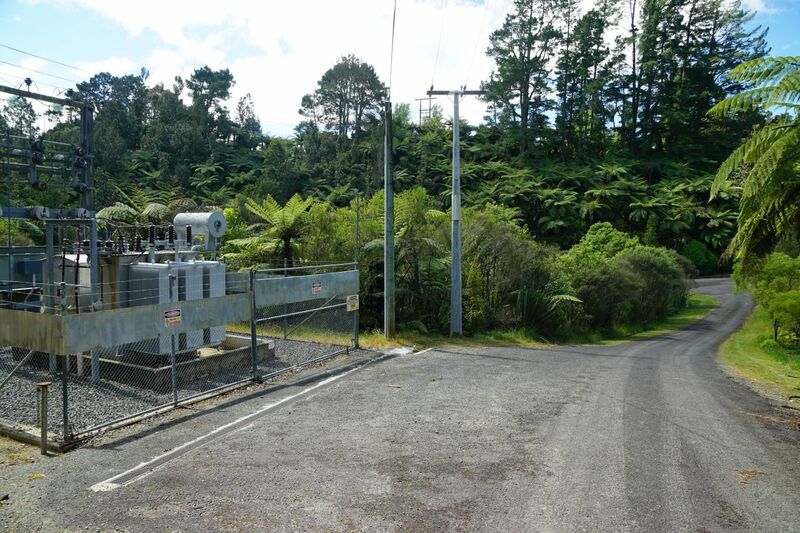 The small substation above the Lower Mangapapa hydro-electric power station fed by water from Lake Mangapapa. 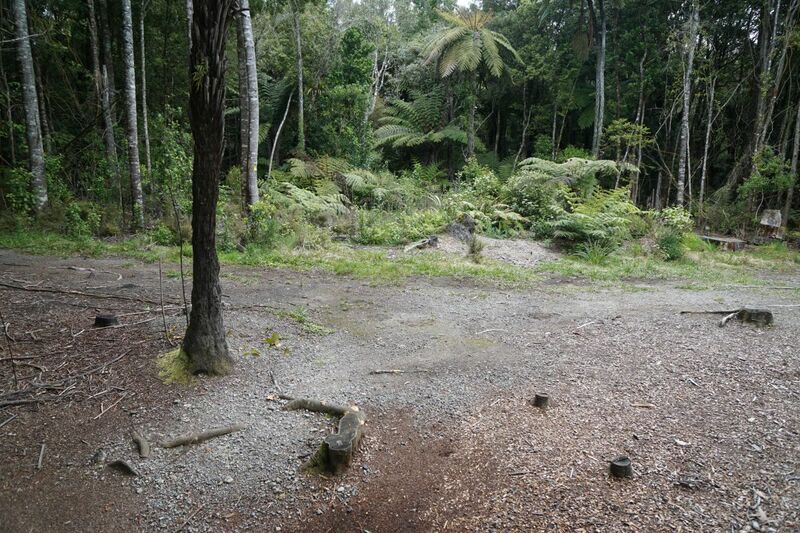 The small parking area by the start of the rimu track can be seen on the far right. A to B: 380 metres, 10 minutes. B to C to rimu: 490 metres, 10 minutes. rimu to E: 200 metres, 5 minutes. E to A: 630 metres, 10 minutes. 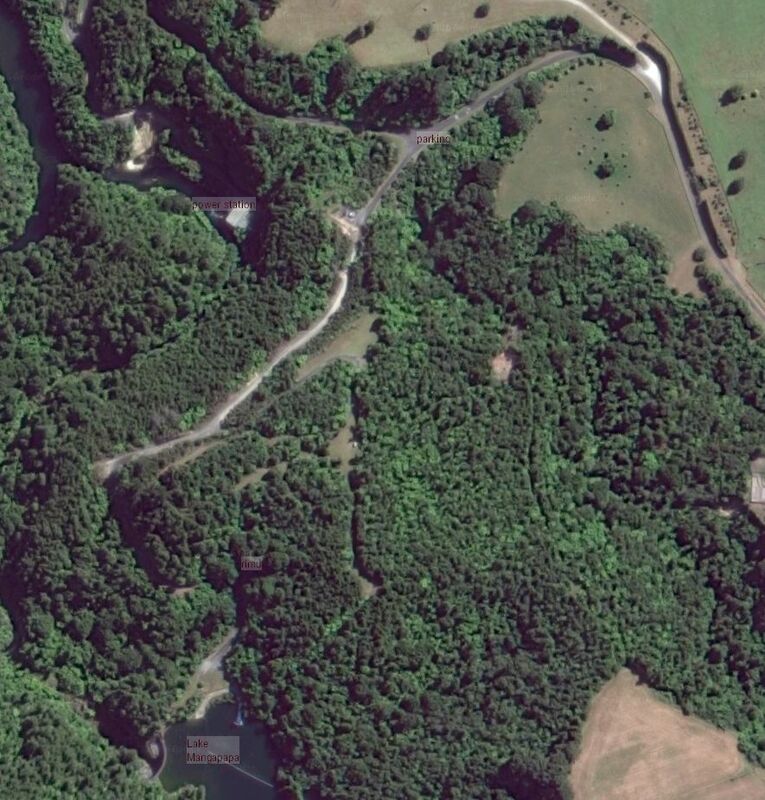 The aerial vew, from Google Maps, shows the area around the tracks. 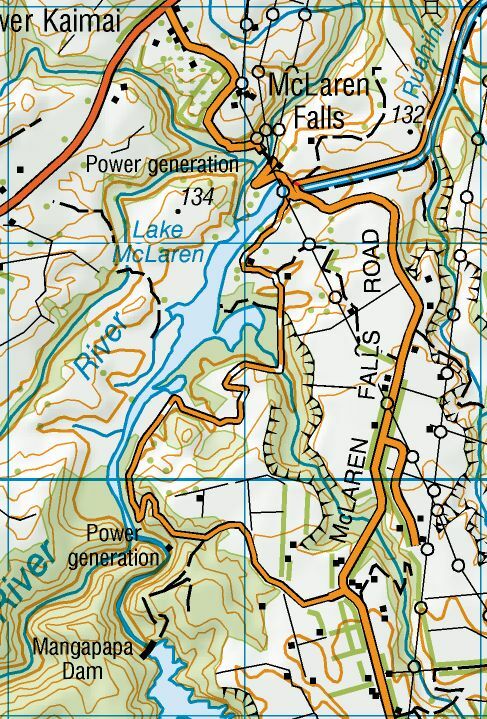 The topographic map excerpt shows the McLaren Falls Park area, with the Rimu Track area shown in the lower left corner. The tracks were walked on November 5, 2016.